Young Poets Network invited young poet Asmaa Jama to review The Emma Press’s latest anthology of poems about kings and queens, written for young people (age 8+). Read her review of this “clever and witty” historical book and discover how the poems within touch on mental health and the changing identity of the monarchy. The Head That Wears A Crown traces kingdom and queendom in the British Isles – from the Anglo-Saxons’ absolute monarchs, who were thought to be chosen by God, to the constitutional ‘figurehead’ monarchy of the present day. 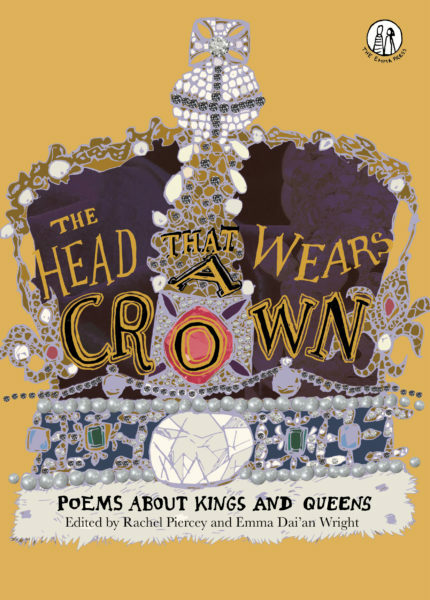 This anthology of poems for young readers explores the changing and plural identities of monarchs, who were often brought up in a different country to their subjects, in fresh and clever ways. One of the poems that brilliantly explores the plural identities of Britain’s monarchy is Melanie Branton’s ‘Knut’. Knut (or Canute) was a Danish king in Britain and his struggle with being an outsider in Branton’s poem ‘Knut’ is symbolised by the letter k. Like Knut himself, the letter k was brought over from Denmark, and every word in the poem with a silent k is separated, as in ‘k-nown’ and ‘k-nights’. Branton’s repetition of words with k’s makes the poem frantic with the king’s desire to be accepted. Like many immigrants, Knut dreams of belonging, and dies before he is considered part of the history and culture of his country. The Head That Wears A Crown also shows how violence has shaped the identity of many monarchs –in war and in rivalry for the throne, but also within themselves. For example, in Richard O’Brien’s ‘Henry’s Heart’, Henry VI struggles not only with the violence of the War of the Roses, a series of English civil wars, but also the inner battle of his mental health, particularly his feeling inadequate to reign. O’Brien writes with stunningly quiet reflectiveness and unravels Henry VI’s life in fragments spaced out across the page. Henry is plagued with ‘WAR’ that twice interrupts the poem’s quiet stream of consciousness, as it interrupted his life. O’Brien creates these mind-numbing white spaces, silences, symbolising what is not spoken about: his trauma and struggles with mental health. Henry’s battle with mental health is only alluded to through parallels with war in this poem, and the description (and illustration) of how he ‘spaced out’. It is made taboo, unspoken but felt in the silent spaces and in the historical notes accompanying the poem, reflecting how mental health in our society is in many spaces unspoken and misunderstood. Although violence is a strand throughout the book, what is largely omitted in the poems is the violence perpetuated by the monarchy against people of colour, particularly during the transatlantic slave trade and the formation of the British Empire. There seems to me to be only a single poem that addresses this darker aspect of Britain’s history: Anna Kisby’s ‘A nice cup of tea and a sit down’. In the first stanza of this poem, the speaker thanks Catherine of Braganza, wife of King Charles II, for ‘crossing the sea and gifting us tea’ in a falsely cheery tone. In the second, however, this cheeriness becomes ironic and the poet ends the poem remembering how Catherine ‘stirred up our taste / for tea drinking days so our history is bitter / with plantations of slaves’. In this way Kisby subtly shows how easy it is to ignore the perspective of an oppressed group of people, and white-wash history. The contrast between seeing tea as a ‘gift’ and seeing it as a result of ‘plantations of slaves’ makes the latter even more shocking. Woollard’s whimsical take might be less frustrating if the topic were more seriously addressed in the other poems in the book. In Rebecca Colby’s ‘The Prince and the Beauty’, King Edward VIII is romanticised: ‘denied coronation, exiled from his nation … these hardships he bore, to make his heart soar … to remain with his true love’. Although Edward and his wife were known Nazi sympathisers, he is made to seem simply a victim, rather than a complex personality. And only Edward’s Nazi sympathies are mentioned in the historical notes, not his wife’s. It often seemed to me that the historical notes were the most useful and honest parts of the anthology in terms of giving context to the monarchs’ lives and deaths, where the less ‘palatable’ parts of history were euphemistically alluded to or skimmed over in the poems. The book also includes an interview with an historian, Dr Kate Wiles, and prompts for readers to write their own poems, encouraging greater exploration of the themes touched on in the book. 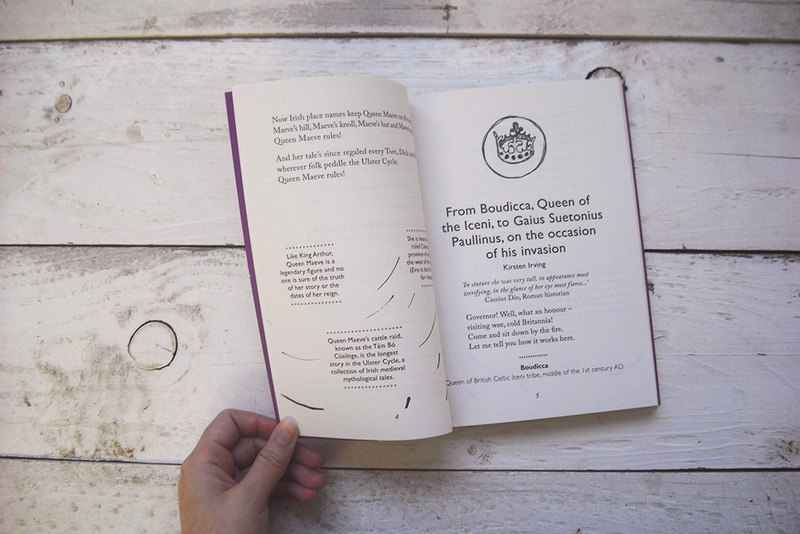 Overall, this anthology is filled with poems that are clever and witty, which oftentimes are sensitively and stunningly written, exploring important topics like mental health and identity, in often refreshing and radical reimaginings of the monarchy and its monarchs. An anthology of this size and for this younger audience (children aged 8+) can’t be expected to cover every aspect of the monarchy; however I would have liked to see more discussion of these often overlooked parts of the monarchy’s history. 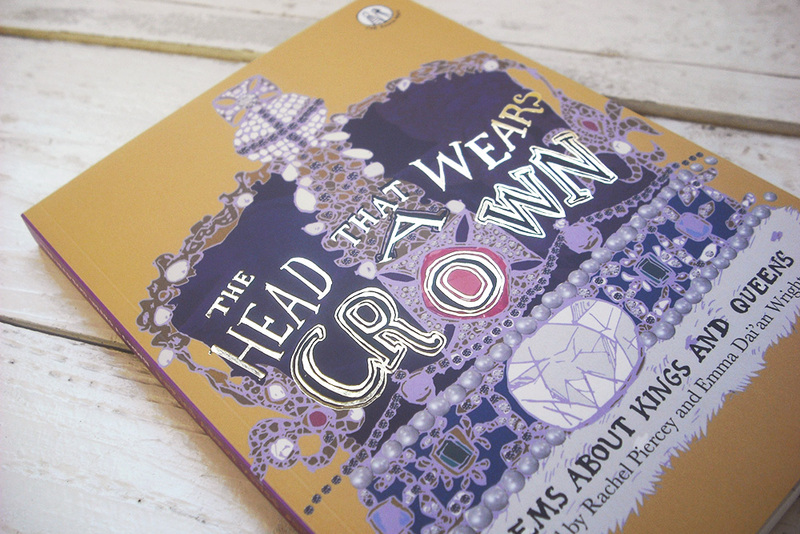 You can purchase a copy of The Head That Wears A Crown on The Emma Press website. Asmaa Jama is a Somali poet and visual artist based in Bristol. Her writing has been published in print, in Popshot magazine and the Paper Swans’ Young Poets’ anthology and online on the Young Poets Network. Her art has been featured online by Dark Yellow Dot. Her work mainly focuses on her experiences as a third-culture kid in the UK. The Emma Press is an award-winning independent publishing house based in the Jewellery Quarter, Birmingham. It was founded in 2012 by Emma Dai’an Wright and is dedicated to producing beautiful, thought-provoking books for adults and children, and to making poetry accessible to everyone. The Emma Press publishes themed anthologies, illustrated chapbooks and children’s poetry and fiction, with a growing list of translations which includes titles from Latvia, Estonia, Indonesia, Spain and the Netherlands. Moon Juice, a poetry collection by Kate Wakeling for children aged 8+, won the 2017 CLiPPA (Centre for Literacy in Primary Poetry Award) and was also nominated for the 2018 CILIP Carnegie Medal. The Emma Press has been shortlisted for the Michael Marks Award for Poetry Pamphlet Publishers four times and won in 2016.